For the entirety of July, I've not bought a single piece of clothing. And I didn't set out at the beginning of the month with that intention, it just sort of happened but when I realised that I'd got 20 days into the month without purchasing anything it pushed me to make it all the way to the end and it feels liberating. Although my relationship with material items has changed drastically from what it used to be I do still love the thrill of a good purchase. Something I did make a conscious effort to do this month, however, was to wear something different every single day and I found it really fun. I'm such a creature of habit when it comes to style and tend to gravitate towards the same things in my wardrobe and by doing this it's been like shopping my own wardrobe and these are all the items that I've rediscovered. These used to be my most loved jeans a few years ago but as I fell a little out of love with denim these got pushed to the back of my wardrobe. Of course, I have not been wearing these recently as we've had a crazy hot spell in the UK but I pulled them out a few times before the heat hit. As they're coated they are a nice twist on traditional denim and tend to look a tad smarter. I don't love the Joni style as much as I once did and have gone back to preferring the Leigh style but they are still something I'll wear until they're on their last legs. I absolutely love stripes and my Breton's are amongst some of my most worn items. But I hadn't worn my striped Brandy Melville dress for a good year or so and it's one of my most loved items as it's so baggy and comfortable. I think one the reasons I haven't been reaching for this as much as I should is the sleeves weren't quite right but a few safety pins fixed those and now I find myself wanting to reach for it whenever I'm feeling a little bloated and rubbish. A striped t-shirt dress is such a solid wardrobe staple as it can be paired with so things. My favourite way to wear this is with a pair of Converse, tote bag and then a leather jacket when the climate calls for one. During my university days, I used to have a lot of pairs of Vans but slowly got rid of them over the years. The only pair I've clung on to is my burgundy pair and I go through stages of wearing them a lot and then they'll sit on the shoe rack unloved for months. I really don't find this style very comfortable at all and they give me blisters all too easily. But when they're not giving me blisters I do love how they look paired with a casual outfit and they're a great summer dog walk shoe. Although they're not my preferred casual shoe I will say that they stand the test of time, I must have washed these 10-15 times and they're still going strong. Another striped item, shocking. 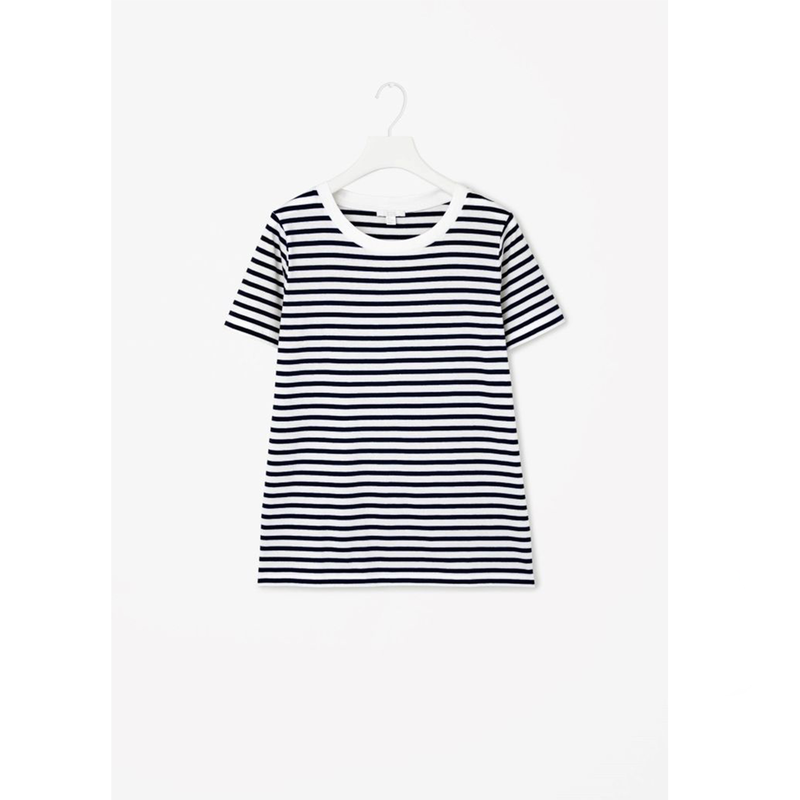 I put this classic striped t-shirt from COS into my drawers as more of a loungewear piece as I didn't find myself wearing it all that much but I've pulled it out a few times lately and fallen back in love with it. For a COS item, it's super affordable and still something that they sell now, the quality is perfect for a t-shirt as it's weighty enough to hold its shape but it's not too heavy that you're not able to wear it in the heat. I love this paired with denim shorts and Converse and with a paired of tailored shorts it would work beautifully for a smarter look. I bought these grey moccasins a good few years ago and they're undoubtedly one of the comfiest pairs of shoes that I own, yet I rarely wear them. Infact, I'd put them to the side to go to charity but pulled them back out as another pair of shoes that given me a few blisters so needed something super comfortable and these fitted the bill perfectly. And apart from winter, you can wear these all year round and they're easily paired with any type of outfit. Have you ever been on a spending Ban?